One thing I always have in my pantry is a bag of Hurst's 15-bean soup mix. I throw away the packet of fake ham seasoning. Then I chop up some onions, carrots and celery and get to work. 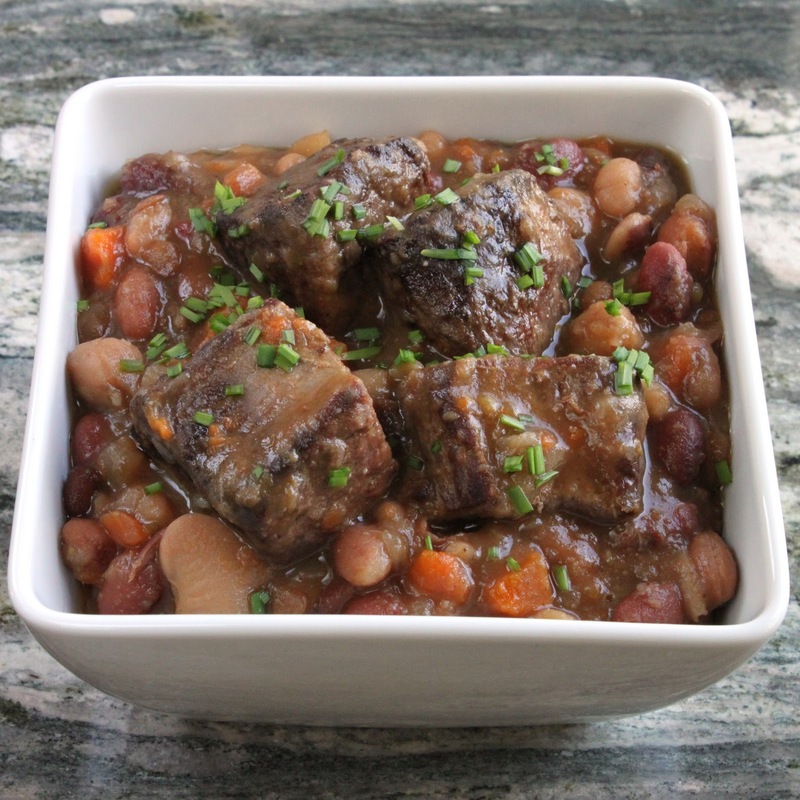 Normally I start the pot with a little bacon, but this time I used beef stew meat. Because I didn't have any bacon and I was too lazy to go out to the store again. 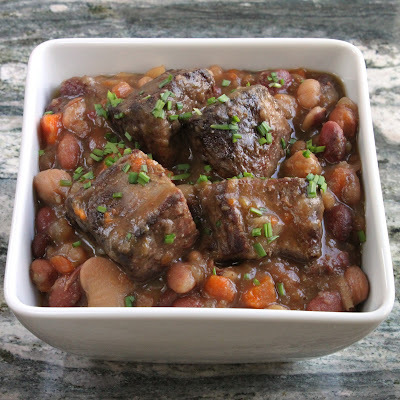 How did it happen that I didn't have bacon and did have beef stew meat? Well...I'm not always an organized shopper. Sometimes I take my list and cross things off as they go in my cart. And sometimes I wing it and assume my little brain will be able to remember everything I need without writing it down. Which, most of the time, it can't. I love one-pot meals, especially on weeknights. Serve this with some cut-up raw vegetables or a green salad and you're done. 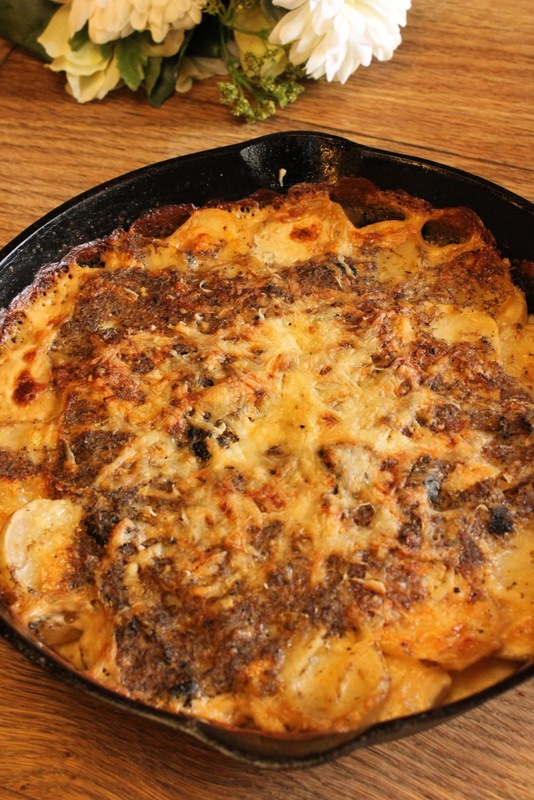 If you can, make this recipe a day or two in advance and let it sit in the refrigerator. It's way better after sitting for a day or two. 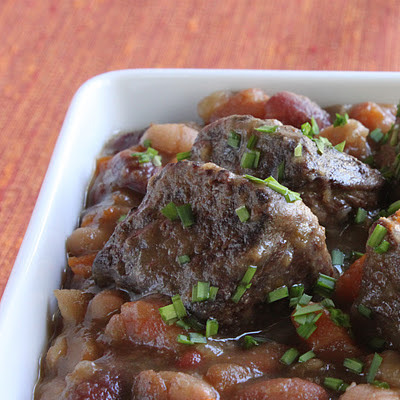 A simple thick stew with beef and mixed beans. 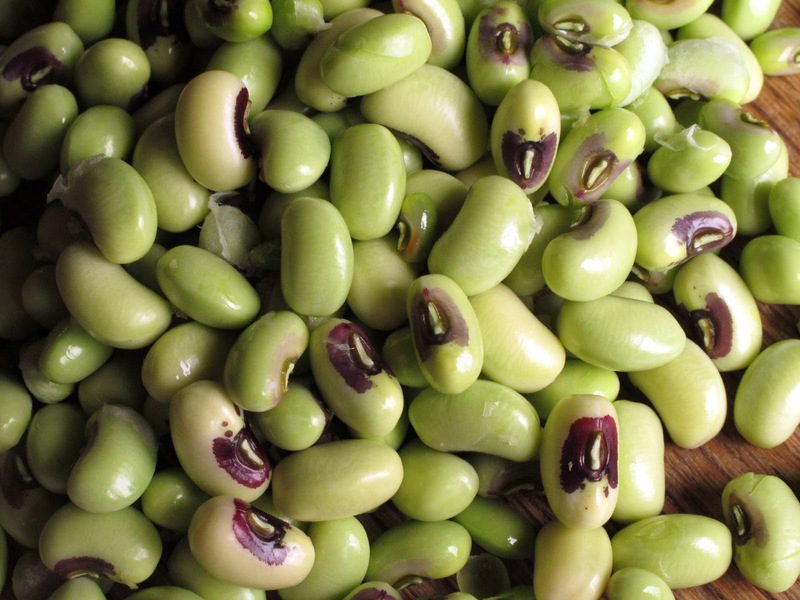 Turn this into soup by adding more water during the cooking process. Heat a large, heavy pot over medium-high heat. Spray the pot with cooking spray and add the beef in a single layer. (You may have to do this in batches, depending on the size of your pot.) Brown the beef cubes on all sides - let them get nice and crusty. Take them out of the pot and put them on a plate.Now add the onions, carrots and celery to the pot and stir to coat the vegetables with the beef juices. Saute the vegetables about 5 minutes, until they are softened and glazed with the browned beef juices and bits.Rinse the dry beans in a strainer, then dump them into the pot with the vegetables. Add back the beef plus any juices that have accumulated on the plate. Put in the tomato sauce and bay leaves plus enough water to cover everything by one inch. Bring the pot to a boil, turn the heat way down to low, cover the pot, and let it simmer about two and a half hours, until the beans are soft and the beef is fall-apart tender. Check the pot every half hour or so and add more water if it looks like the beans have absorbed it all.Season the stew with salt and pepper. Serve hot garnished with the chopped herbs. It's time for me to develop some better eating habits. I'm not a junk food addict or a sugar nut. In fact, I'd say that overall my diet is pretty good compared with most of America. But I lean too much toward white starchy stuff (bread, pasta, rice), and I could definitely stand to eat more greens. I'm spending the next half-year working with Rachael Pontillo of Holistically Haute, a health and wellness coach who focuses on incremental change and overall happiness and well-being. She's not a doctor and I'm not looking for a diagnosis or a prescription. I need help creating some better eating habits that, with luck, will crowd out some of the not-so-good ones. And if that comes with weight loss, so much the better. I hate being told what to do and am resistant to "always" or "never" rules when it comes to food - in fact, I've already told Rachael I might not be her ideal client. She's been patient with me. In our first session we talked about my daily routine, typical meals, what I might be missing in my diet. Rachael's first requests were that I drink more water, particularly first thing in the morning, and try to get in more raw greens. I'm occasionally fine with salad for breakfast, but every day? I don't think so. Rachael gave me her loose recipe for green smoothies. She drinks 16-20 ounces of this for breakfast every morning. 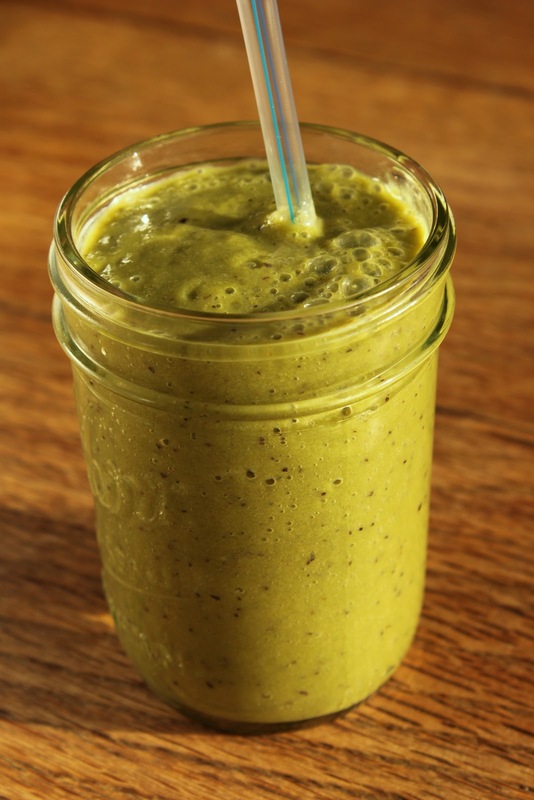 I don't like smoothies much, and I was kind of grossed out by the whole concept of blended kale. But, in the spirit of change, I tried it. And I liked it. Rachael also told me not to worry so much about what I'm eating, but to try to remember how what I eat makes me feel. Know how the green smoothies make me feel? Like Superwoman. Seriously. I drink it and for two hours I've got this light, clear focus. It doesn't keep me full until lunchtime, but that's okay. The other day I had an egg sandwich for breakfast. No Superwoman feeling at all. On the down side, the green smoothies have been a little hard on my early-morning digestion. I'm only drinking about eight ounces and will work my way up as my body adjusts. I'll report back occasionally on the progress I'm making in my work with Rachael. Don't worry, this isn't turning into an uber-healthy blog. There will still be meat and cake. After all, it's all about incremental change and moderation. P.S. If you're interested in Rachael's comments on this post, click here. A healthy way to start the day, inspired by health and wellness coach Rachael Pontillo of Holistically Haute. The fresh mint and lime take away any bitterness from the kale and dandelion greens. Freeze portions of the extra smoothie for future breakfasts. Add all ingredients plus a little water or ice into a blender. Puree on high 2 minutes or until smooth. Serve immediately or freeze for future breakfasts. My 12-year-old son Emery has excellent eating habits. He dislikes most sweets and loves vegetables. Given the choice between fast food and Real Food Daily (a local vegan restaurant) he'll choose RFD any day. A few days ago I bought beautiful turnip greens at the farmers' market. When I told Emery I was planning to put them into a quiche, he had a tantrum. "Why would you waste such a good vegetable by drowning it in cream and cheese?" he wailed. I argued back for a few minutes and then realized I was nuts. My kid begs to eat unadorned turnip greens and I say no? What was I thinking? I try to pack healthy foods in my kids' lunchboxes, but apparently I wasn't doing a good enough job, because Emery came to me with a specific request: lunchbox salads. We came up with this recipe together, choosing vegetables that wouldn't get soggy and had enough heft to keep him full through the afternoon. I still packed sandwiches and yogurt for Hot Dog Boy, but Emery and I happily ate this salad for lunch for a whole week. 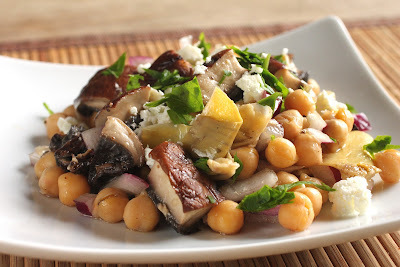 A hearty salad that holds up well in a lunchbox and gets better when it sits a day or two. Heat a ridged grill pan on the stove over high heat. Lay the portobello mushroom caps in the grill pan and cook about 4 minutes on each side, until the mushrooms are well marked and softened but not mushy. 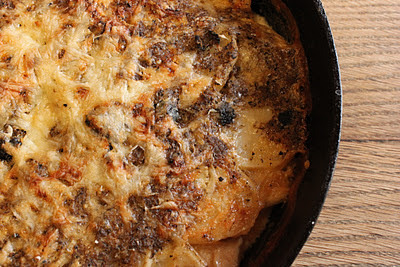 (Alternatively, cook the mushrooms under a hot broiler in the oven.) Cut the mushrooms into 1-inch chunks.In a large bowl, gently mix together the mushrooms, chickpeas, chopped artichoke hearts, red onion, feta cheese, lemon juice, parsley and olive oil. Taste and season with salt and pepper - you shouldn't need much salt, because the artichoke hearts and feta are plenty salty. Let sit at room temperature at least 30 minutes before serving to let the flavors come together. If you come across quince - a lumpy, bumpy fruit that looks like a fuzzy apple - take a few home. I hear they eat quince raw in Mexico with chili powder, salt and lime, but that's too tart for me. I prefer to peel quince and poach them in simple syrup with a squeeze of lemon and a bit of vanilla bean. The quince flesh gets soft and turns from creamy white to coral. You bite into it expecting the grainy texture of cooked pears, but instead you get toothsome velvet. A few weeks ago I ordered a case of quince from Jim Jaffe, the produce manager at Bob's Market, a small family-owned grocery store in my neighborhood. Jim's been in the produce business a long time, and he goes to the Los Angeles wholesale produce market himself when the rest of the world is fast asleep. He knows his suppliers, knows his customers, and favors flavor over appearance when he orders. Jim takes my requests for a case of quince or sunchokes in stride. If it's in season and available, it's in the back of the store waiting for me the next day. 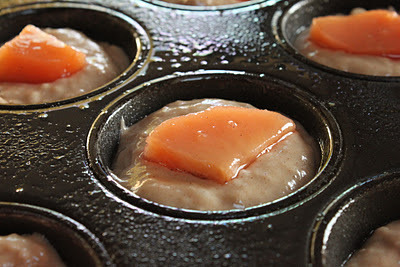 I overdosed on rich segments of poached quince, then pureed what was left and made muffins. Beautiful to look at, spicy and floral under the nose, delicious in the mouth. Pureed poached quince gives these spice muffins an exotic twist. Note that the cooking time does not include preparing the poached quince, which should be done ahead. Preheat oven to 350 degrees. Spray a 12-cup muffin tin with nonstick cooking spray.In a large bowl, whisk together the sugar, pureed quince, oil, eggs and milk until well combined. In another bowl, stir together the flour, baking soda, baking powder, cinnamon and salt. I always put my baking soda and baking powder through a little sieve to make sure there are no lumps, but you're welcome to take your chances.Pour the dry ingredients into the wet and stir gently just to combine. The batter will be lumpy, and that's okay. Stir too much and you'll end up with hockey pucks instead of muffins.Divide the batter among the 12 muffin cups. Lay a slice of the poached quince on top of each muffin. Bake about 25 minutes, until the tops of the muffins are starting to turn golden and a toothpick comes out clean. Cool 2 minutes in the muffin tin, then remove the muffins and cool completely on a rack. If they last that long. I've finally compiled a full list of all the recipes here In Erika's Kitchen. You've always been able to search by keywords or click on one of the words in the "Find It" tag cloud. Now you can also browse through a complete categorized list by clicking on "recipe index" under the green banner at the top of each page. In case you're wondering, I created my recipe index by hand. No fancy whiz-bang apps helping out here. Just me, going post by post back through the archives, cutting and pasting each recipe title into the categories in which it belongs. I learned something very interesting about my food tendencies during this project. Guess which categories had the most entries? Not the sweet stuff (cake, cookies, chocolate, pie). And not my weaknesses (pasta, rice, potatoes, bread). And not the proteins, either. Yes, the fattest categories in my index are fruit and vegetables. Does that make In Erika's Kitchen a health food blog? Not exactly. But it does reflect my style of cooking and eating. Note to self for 2012: Post more chocolate, chicken and pizza recipes! 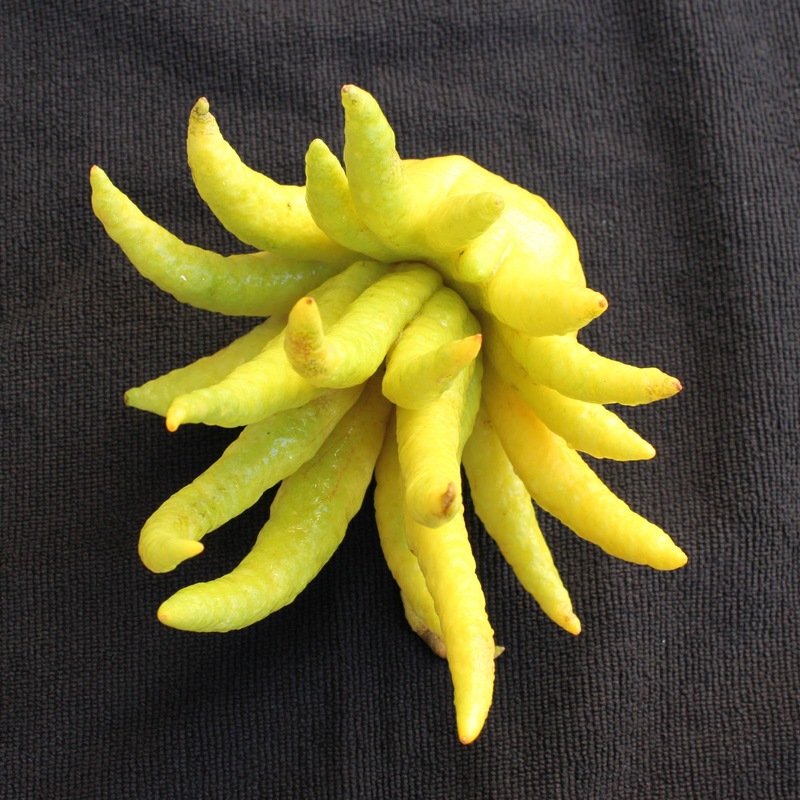 A few weeks ago I got my hands on a crazy citrus fruit called Buddha's Hand. 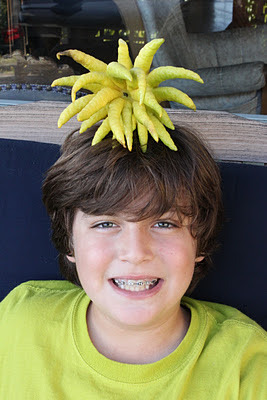 Imagine the offspring of a lemon and an octopus, and you're in the right ballpark. I got a head start on holiday gifts by cutting a few fingers off my Buddha's Hand and sticking them in a jar of vodka. I cut a few more off and put them in a jar of sugar. A week or two in the dark and I'll have Buddha's Hand infused vodka and Buddha's Hand infused sugar - excellent holiday gifts for gourmand friends. For more immediate gratification, I minced a few more Buddha's Hand fingers and baked them into shortbread. I used the rind and some of the pith. The resulting shortbread was crisp and buttery and so lemon-plus-roses fragrant that even a zip-top bag couldn't contain the aroma. Buddha's Hand shortbread with a cup of strong black tea, sitting by a cozy fire on a rainy afternoon - doesn't that sound lovely? Thanks to Melissa's/World Variety Produce for supplying the Buddha's Hand for this recipe. 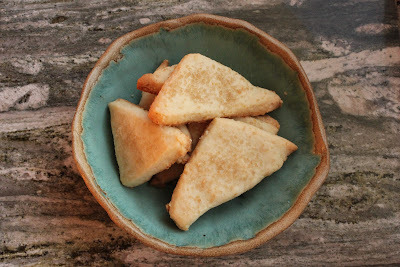 Fragrant Buddha's Hand shortbread - time for tea! Shortbread gets a boost of fragrance from chopped Buddha's Hand, an exotic citrus fruit that smells like a cross between lemon and roses. Preheat the oven to 325 degrees. Line a baking sheet with parchment paper.In a stand mixer (or a bowl with a hand mixer), cream the butter, sugar, salt and chopped Buddha's Hand until the mixture is fluffy and fragrant. The action of the mixer will release the essential oils in the Buddha's Hand rind, so it's important not to cheat this step.Remove the bowl from the mixer and add the flour, mixing gently with a spatula or your hands until the dough comes together - it will be dry and crumbly, but that's okay. 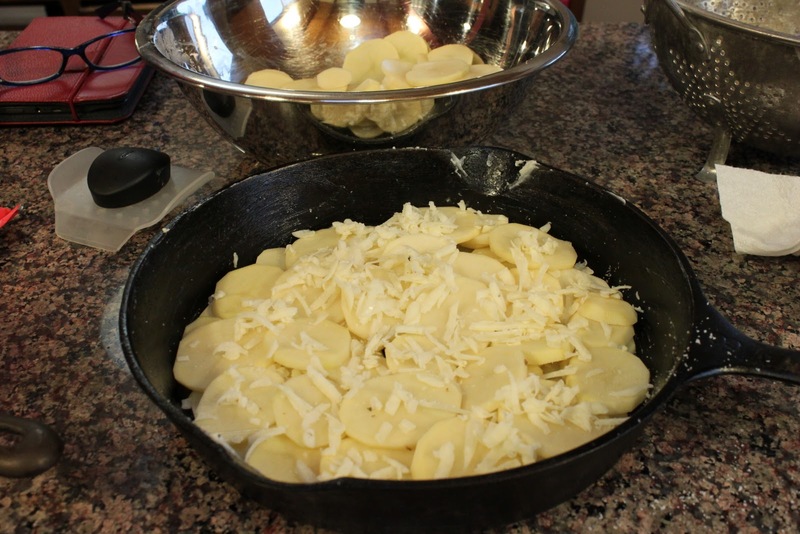 Turn the dough out onto the parchment-lined baking sheet and form it into a rectangle about 1/2-inch thick. 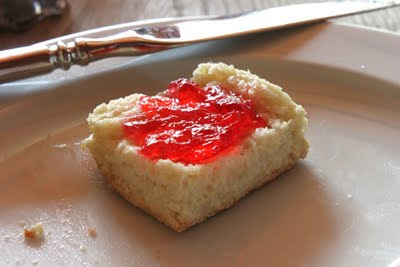 Sprinkle the raw sugar on top and press the sugar into the dough with your hands or a rolling pin. Cut the dough into small squares or diamonds and separate the cookies a bit on the tray so air can circulate between them. They won't spread, so you don't have to leave a lot of room in between.Bake about 25 minutes or until the cookies are just turning golden at the edges. Cool on a rack. Serve with tea. When I walk around my neighborhood, I catalog fruit trees. I know who has the most prolific loquat, whose tangerines are ready to drop, and whose Santa Rosa plums need pruning. I've tried, and failed, to gather enough courage to knock on the front doors belonging to the apricot, fig and tangelo trees whose fruit I covet, even though I suspect the squirrels are getting most of it. Backyard fruit is one of the best things about living in southern California. Especially when said fruit belongs to friends who are happy to share. Last week I brought home a bag of Fuyu persimmons from a friend's yard. Once again I forgot that no one in my house likes persimmons. 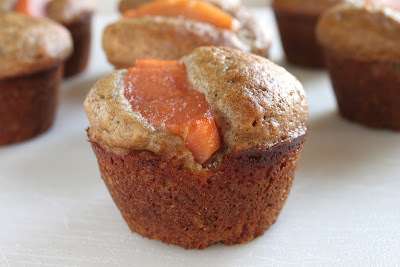 Last year that same mistake resulted in a batch of delicious persimmon spice muffins. 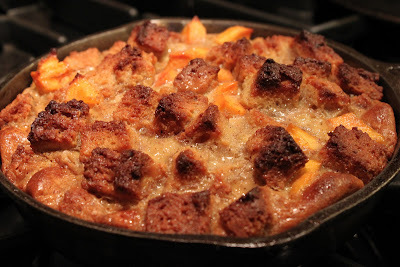 This year I was in the mood for bread pudding. Leftover cornbread makes an excellent foundation for bread pudding, by the way. Cut it into cubes, dry it out in the oven, and soak it in custard just as you would any other bread. It's more dense than challah or brioche, so the final pudding is more chewy than airy, but the flavor is knock-your-socks-off special. Especially when combined with sweet, exotic persimmons. I'm thinking this persimmon cornbread pudding might just become a regular on Californian Thanksgiving tables. Sorry, squirrels. We're taking back our fruit. 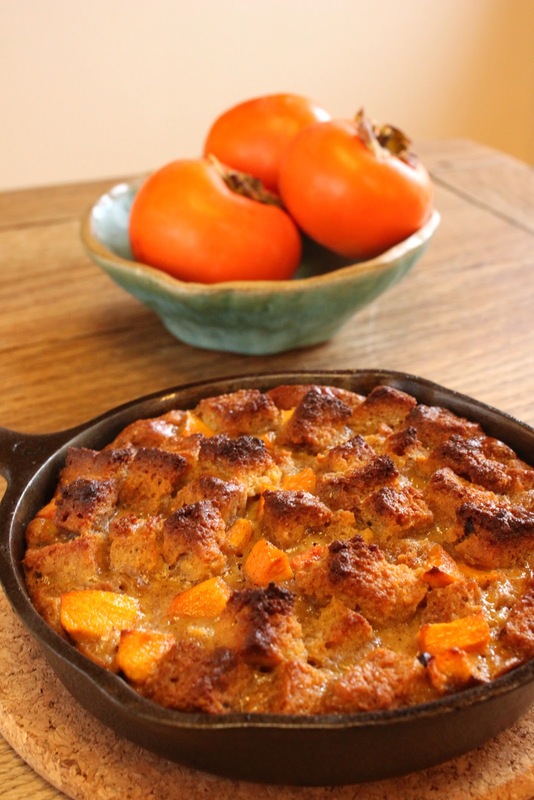 Leftover cornbread and crunchy Fuyu persimmons bake up sweet and satisfying in this custard-rich bread pudding. Perfect for Thanksgiving. Preheat the oven to 350 degrees. 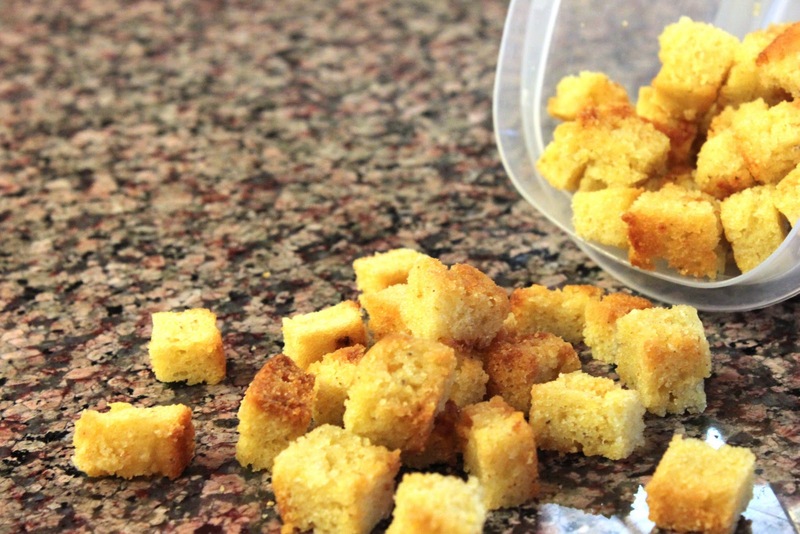 Cut the corn bread into small cubes, about 3/4-inch square. Put the corn bread on a baking sheet and bake until the squares are lightly browned and crisp, about 15 minutes. You don't want them to burn, but you want to try to get them as dry as possible. Remove the corn bread from the oven and raise the temperature to 400 degrees.While the corn bread is toasting, peel the persimmons and cut the flesh into bits about the same size as the corn bread cubes.In a large bowl, whisk together the eggs, half-and-half, sugar, cinnamon, salt and vanilla. 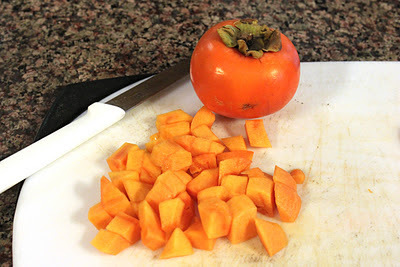 Add the toasted bread cubes and the diced persimmons and toss well. Let the mixture sit in the bowl, tossing occasionally, about 30 minutes. Spray a 9x13-inch baking dish with cooking spray. Pour in the corn bread mixture, including all the liquid. Bake about 45 minutes, or until the pudding is set and no longer jiggles when you shake the pan.Let cool at least 15 minutes before serving. The pudding will be puffed up when it comes out of the oven, but don't be alarmed when it falls - that's normal. Serve warm or at room temperature. Whipped cream would be a lovely accompaniment. 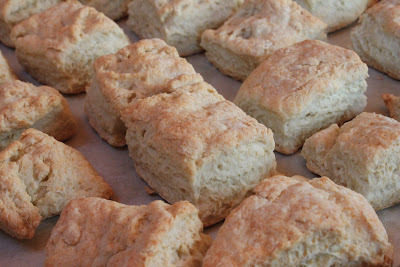 You may not believe me, but you can make very respectable biscuits without butter or shortening. I got my favorite biscuit recipe via Ellen, one of my college roommates, who in turn got it from her mother as a wedding present. The recipe had been handed down through several generations. There's no butter, no shortening - only vegetable oil and either yogurt or buttermilk. Ellen's mom is from Texas, so in my romantic fantasies I see poor Dust Bowl farmers with dried-up cows, forced to find a new way to make biscuits. I have no idea whether that's anywhere close to reality, but I don't really care. I like my fantasy and I like the biscuits. That red stuff below, by the way, is prickly pear cactus jelly my 12-year-old son brought me from Arizona. Loved the color, loved the concept, loved that he brought me a present. The flavor - nothing special. But it worked fine on a steaming hot biscuit. I've made many variations on this basic biscuit recipe, including cheese biscuits, biscuits with Jarlsberg and bacon, and biscuits with mushroom beef gravy. It's a blank canvas. What would you put in your biscuits? A basic biscuit recipe with no butter and no shortening. Does it still taste good? I think so, but you be the judge. Preheat the oven to 425 degrees. Line a baking sheet with parchment paper.In a large bowl, whisk together the flour, baking powder, baking soda and salt. I always sift my baking powder and baking soda into the bowl through a small strainer because once I made muffins that contained large lumps of baking soda, and I will never forget that awful taste. You may take whatever chances you like.In a measuring cup, gently whisk together the oil and buttermilk or yogurt. You don't want them completely combined. 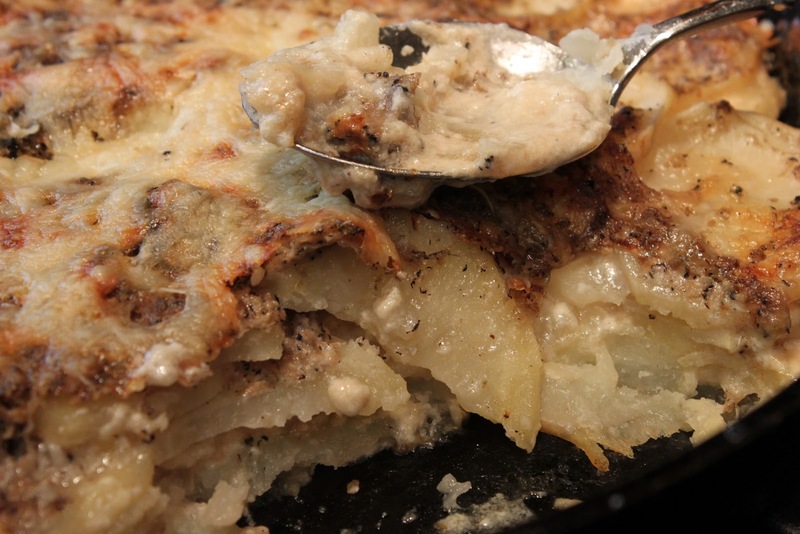 Pour the yogurt mixture into the flour mixture and use a fork to bring the ingredients together into a shaggy dough. Using one hand, knead the dough in the bowl about 8 times, folding it over on itself, until it is rough but holding together.Pat the dough into a circle or a square or whatever. Feel free to use a biscuit cutter to make nice shapes, but personally I hate wasting the scraps, and you can only reshape them once before they start getting tough. I cut the dough into squares or triangles, myself. Put the biscuits on the baking sheet, leaving room for air to circulate in between. Bake the biscuits about 20 minutes, until they're golden brown and the smell brings people running from across the street. Serve immediately with the condiments of your choice. If you have leftovers, always reheat them in the oven or toaster oven - the microwave will leave you in soggy city. I was at a trade show in San Diego this weekend, and on my way home I stopped in Westminster - also known as Little Saigon - to find some lunch. I ate a passable roast pork banh mi sandwich at a strip mall Vietnamese bakery, and then I wandered into the Vietnamese supermarket next door. Just to see what it was like, you understand. Two hours later, out I came with a few bags of groceries that are impossible to find in my neighborhood. Artichoke leaf tea, which my husband finds more stimulating than chocolate. Knobs of palm sugar, the evaporated sap of the date palm tree, with a complex, dusty-sweet finish. And pea shoots, which normally I think of as a spring vegetable. Apparently they're growing somewhere in southern California at the moment, because the store had a huge bin of them. Sometimes I simmer the pea shoots in stock for a simple, cleansing green soup, which my 12-year-old gourmand likes to take in his lunchbox ("Please, Mom, I want to drink cold green stuff out of a jar!"). 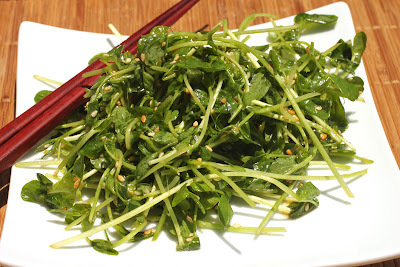 But the pea shoots retain more of their pea-ness when they're eaten raw, as in this simple salad. Dress it lightly, sprinkle it with toasted sesame seeds, and pretend it's spring. An Asian-style salad that lets pea shoots be themselves. In a small, dry nonstick skillet, toast the sesame seeds over medium-low heat, shaking the pan often. Watch the seeds carefully to prevent burning. When the seeds are starting to color and you can smell them, pour them into a small bowl and let them cool.Put the washed and dried pea shoots in a large bowl. In another bowl, whisk together the soy sauce, vinegar, sesame oil, grapeseed oil, honey or agave, and salt and white pepper. Taste the dressing and adjust - I always want more acid, but everyone's palate is different.Pour the dressing and the sesame seeds over the pea shoots and toss quickly. Serve immediately.